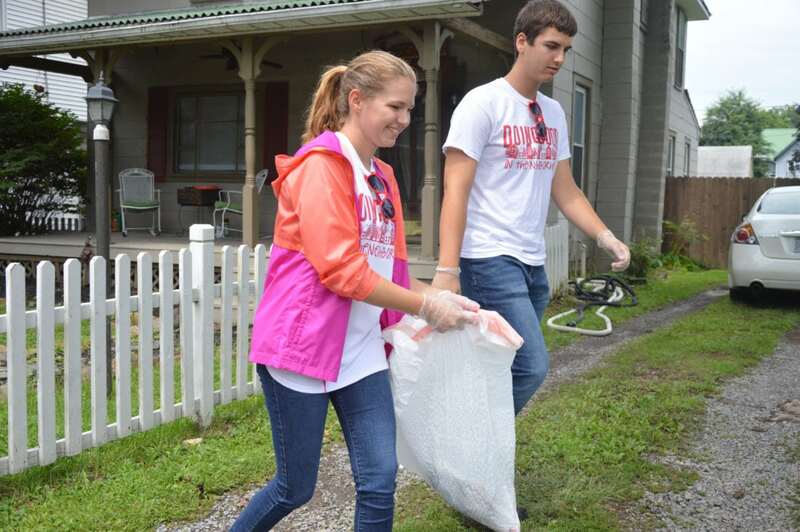 KATELYN HIBBARD/Sun-Gazette Local high school students partnered with Janessa Mitterling State Farm, Muncy, to help community members along Water Street and beyond clean up after the week of rain. Rory Oden, left, and Trey McCollum, both of Muncy High School's Future Business Leaders of America, clean trash out of people's yards and off the sidewalk. MUNCY — The water has receded along the mud-streaked streets of this borough where property owners could be found in yards Friday cleaning up from the recent flooding that inundated parts of the community. Several days of torrential and relentless rains brought Glade Run, normally dry in mid-summer, to swell from its banks, pouring water into basements of homes in nearby streets. “It was worse than I thought it would be,” Janessa Mitterling said. Mitterling, operator of a State Farm Agency at 9 N. Washington St., organized a small group of volunteers to help homeowners with cleanup efforts. She led several Muncy High School Future Business Leaders of America students along streets, picking up garbage and other debris left from the high waters. They knocked on doors to inquire if property owners needed help. “This is awesome,” Mike Diehl said of the volunteer efforts. Diehl stood with a shovel in hand behind a wheelbarrow, pausing from his work scooping up mud left behind from the high waters. He paused to survey the damage to his vast backyard garden, resigned to the fact that many vegetables, now partially buried in mud, are ruined. He was hoping perhaps his tomatoes might be OK. The cellar doors at the side of his East Water Street home were thrown open. “I’m waiting for my basement to dry out,” he said. Diehl declined help from the volunteers but suggested they go next door to pick up branches and other debris scattered about the yard. Dean Shaner, of Mechanicsburg, was in Muncy Friday to help his mother with cleanup efforts. 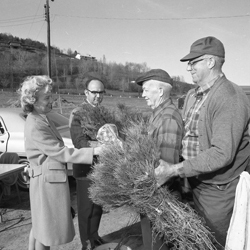 Soon, Mitterling and her volunteers showed up at Shaner’s home to offer their help. “I thought it was great,” Shaner said. About 4 feet of water inundated his mother’s basement in a part of the borough known as East Muncy, and volunteers helped carry away some of the items from the cellar. Among the volunteers were Trey McCollum, a 12th-grade Muncy student, who said he always was willing to lend a hand to others. He said he doesn’t mind getting his hands dirty. Jason Gresh, a Muncy High School math teacher, who coaches soccer and basketball, was along to help along with his daughter, Addison. Makaya Miller, a State Farm employee, said she was surprised at what the flooding did to properties. She said she was glad to be helping out. “After something tragic like this happens, it’s nice to go door-to-door and ask people what they need,” she said. Mitterling said her State Farm agency partnered with the Future Business Leaders of America group in the past, planting flowers in downtown Muncy and raking leaves. She said she decided to organize Friday’s volunteer efforts after seeing first hand the flooding in the borough. Elsewhere, cleanup and repair efforts from flooding continue in the region. State Department of Transportation officials report that maintenance crews in Bradford County are performing flood repairs on Route 4024 (Centerville Road) between Route 4013 (Berwick Turnpike) in Ridgebury Township and Route 4022 (Wilawana Road) in Athens Township. The road is expected to be closed for about two weeks to replace two large drainage pipes and perform shoulder repairs and paving.